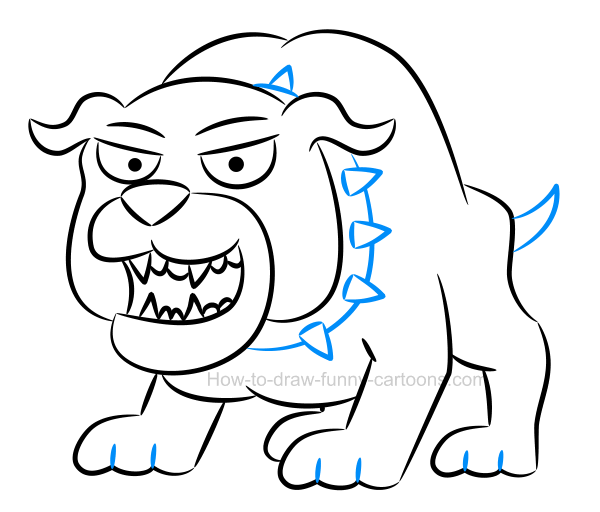 See how creating an illustration of a bulldog can be a simple thing using this accessible step-by-step drawing lesson. 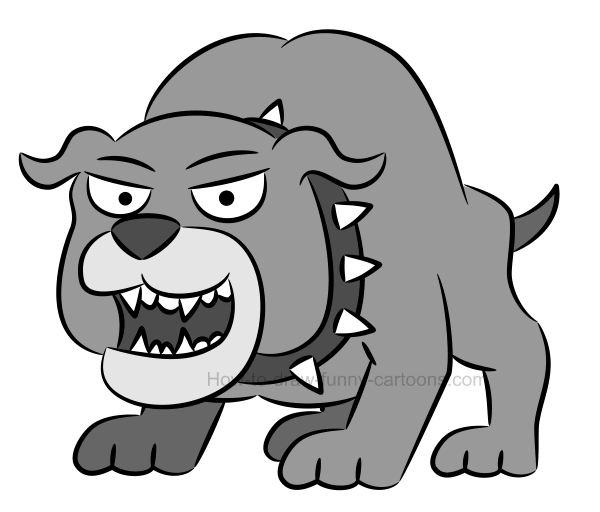 Not only will you learn how to draw this cartoon animal in just a few basic steps, but I will also show you a few tips to help you make the character angrier and more frightening! It's true that these animals are not always aggressive like depicted in movies, books or television shows, but let's keep this characteristic alive for the purpose of this lesson! First, you need to draw small ears made from tiny curved lines. The top of the head can be round, but also slightly flat near the middle. Large eyes with tiny pupils are mandatory. A large collar with spikes must be visible around the neck. The back is strong and filled with muscles. The tail is tiny and mostly made from curved lines. The back legs are also strong and much shorter than the front ones. Paws are bold and thick. The stomach is also loaded with big strong muscles. The jaw is large and made from long curved lines. Several sharp teeth are visible inside the mouth. A large nose made from a triangular shape is drawn above the mouth. Great! 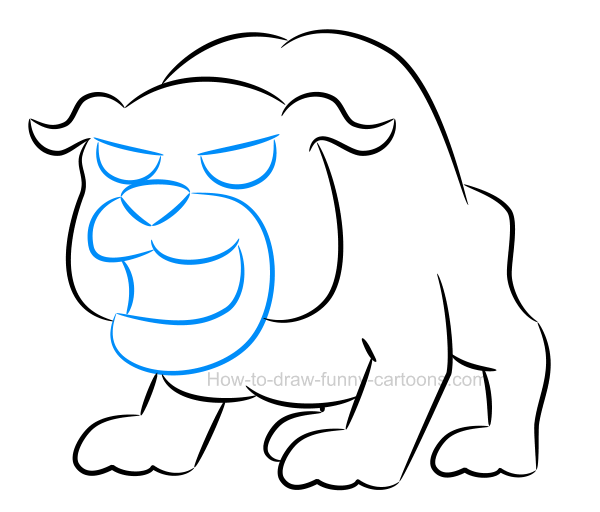 You are now well-equipped to start sketching a beautiful cartoon bulldog filled with muscles, strength and solid shapes. Ready? Let's begin this lesson now! It's always a good idea to create a few basic shapes to help us draw accurate proportions. 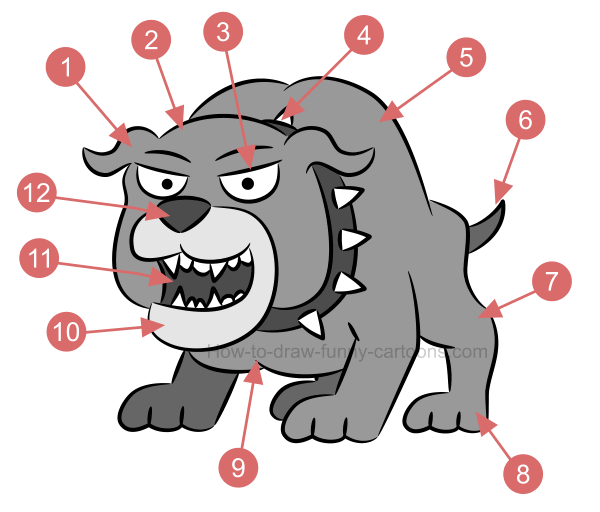 In the case of this illustration of a bulldog, you can start by adding a small circle for the head and a larger one for the body. Then, you can draw small and large rectangles for the legs and small oval shapes for the feet. Now that our template is created, let's draw the character itself! 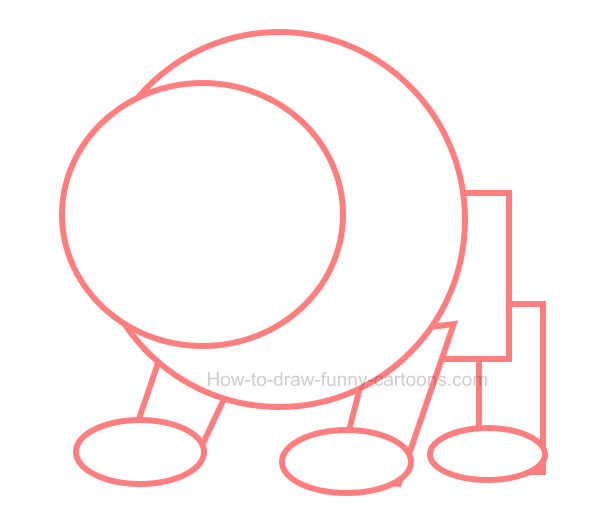 Using the guideline created in the previous step, draw some curved lines to draw the animal. Make sure to draw two large curved lines on the back, small bumps on the paws and tiny ears on top of the head. Also, make sure the back leg is drawn as shown in the illustration below. Once you are done, you can erase the template created earlier (the shapes with an orange outline). Inside the head, draw the eyes using straight and curved lines. Then, you can sketch the mouth and jaw using long curved lines as shown in the image below. You can also create the nose above the mouth using a simple triangular shape. Above the eyes, sketch some eyebrows using a few lines. The pupils are made from simple dots. Complete this fourth step by drawing a few teeth inside the mouth. 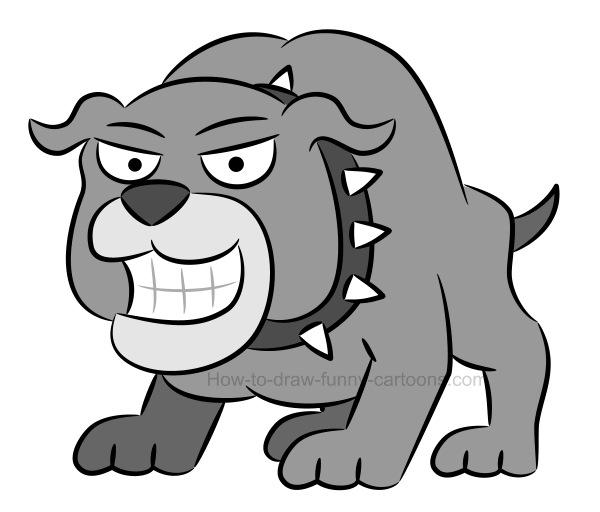 To make this illustration of a bulldog even more frightening, you can create teeth with irregular shapes and positions. Around the neck, draw a large collar made from a long curved line and add some spikes using pointed triangles. Behind the character, sketch a tiny tail using a single broken line. 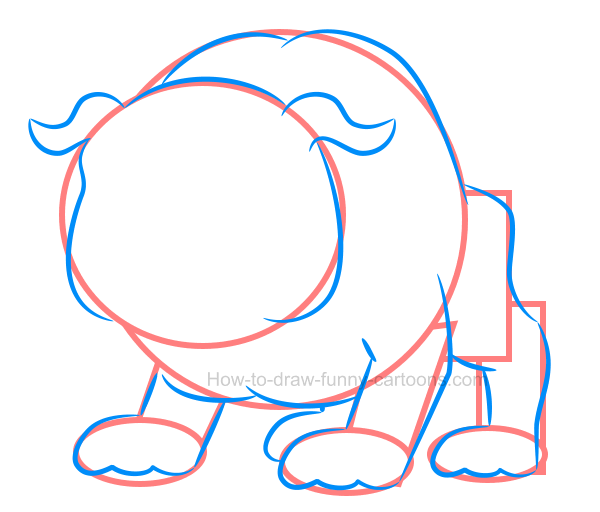 Finally, draw a few straight lines inside the paws of the cartoon animal to complete this lesson on how to draw a bulldog. step 6 - let's fill in this character with dark colors! 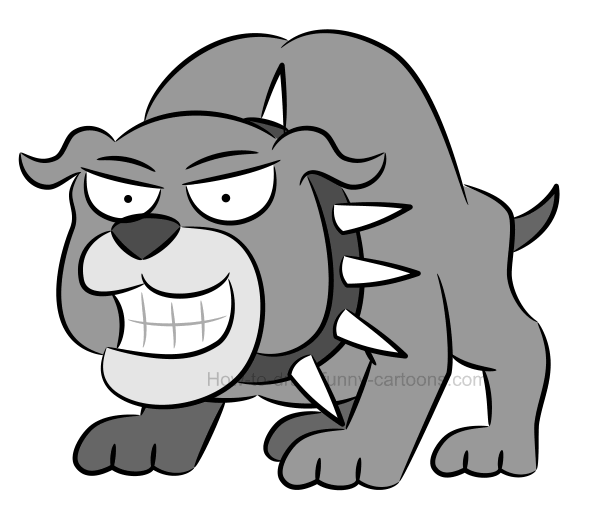 It can be a good idea to use dark grey colors inside this illustration of a bulldog. Areas like the nose, the mouth, the collar and the tail can be filled with a darker color. Both legs drawn behind the character can also be slightly darker. The area around the mouth can be brighter while the spikes, the teeth and the eyes are simply colored in white. Can we make this bulldog angrier? 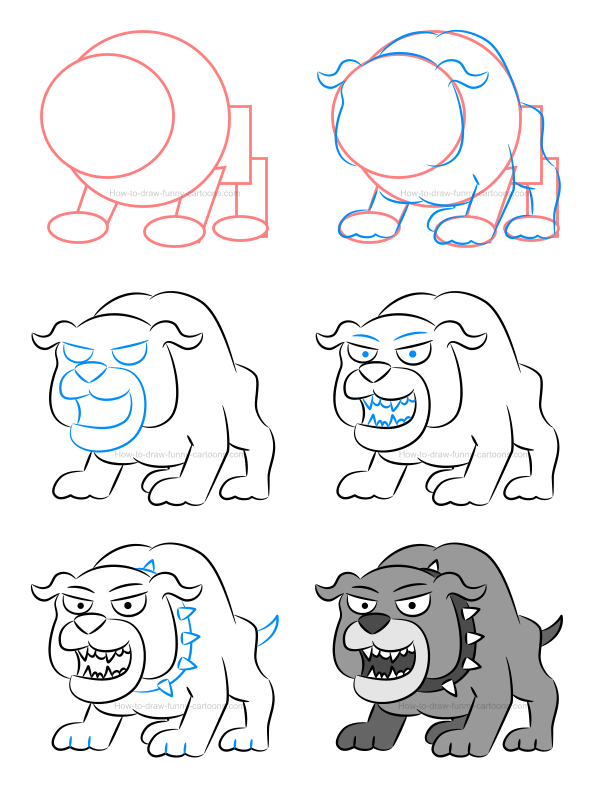 We created a nice cartoon bulldog filled with muscles, details and cool features in just six easy steps. This animal looks terrifying, but can we make it even more frightening? Let's see how we can play with elements like the head, the eyes, the teeth and even the collar to make this cartoon animal more ... aggressive! In this example (using exactly the same character as above), all teeth were modified to something more explicit and visually easier to read. It's true that pointed teeth can be more frightening, but using large squares to create cartoon teeth can also be quite appealing and more intimidating. Let's get back to the original illustration of a bulldog and let's make a single modification: lowering the head. How can it make the character more aggressive? 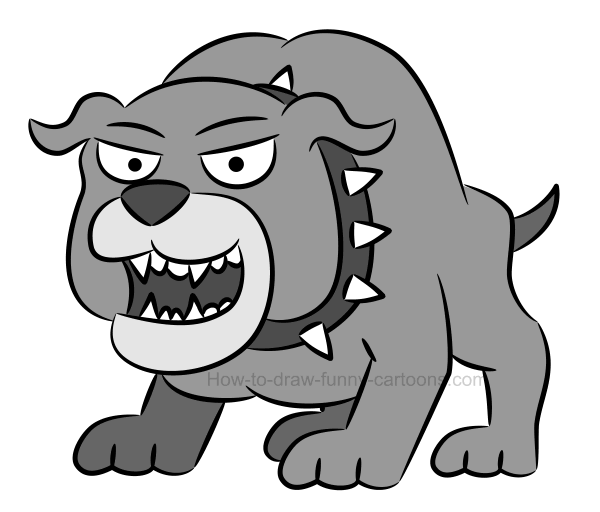 Well, in this case, the cartoon bulldog seems ready to jump or attack someone. Posture can play a huge part when trying to display a particular emotion on a cartoon character. Once again, let's get back to the original bulldog and let's draw very large eyes and tiny pupils. See how the animal almost looks insane? When looking at pictures or illustrations, we are usually aiming for the eyes first. That's something we all do naturally. That's why it's important to make those eyes talk! Large spikes can also do the trick! You don't necessarily need to change a part of the body to create a more intimidating illustration of a bulldog! Playing with accessories like the collar can also do a good job! In this example, all spikes were drawn using larger triangles to make the object bigger and sharper! Finally ... why not mix all these elements into one illustration?